Special Studies, Ceramics, Sesto Florentino and Life Drawing, Florence, Italy (1971-72). 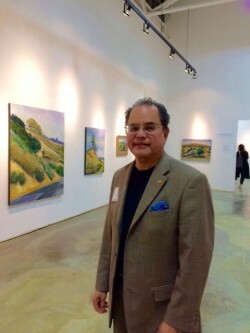 “Landscape By Daylight”, Gallery 2905, San Jose, CA, July 2014. “Arte Tejano”: Texas Southmost College, Brownsville, September 1988; Resource Center for the Arts, El Paso, 1987; and Galeria Chaparral, Corpus Christi, 1986. “Watercolors and Drawings”, Harding Mott University Gallery, University of Michigan at Flint, January 1981; First Union Bank Gallery, Columbia Plaza, Washington D.C. November, 1980, Texas Southmost College, Brownsville, April 1979; and Downtown Central Library, September 1973, Houston, TX. “Studio Works”, Dominican Institute of the Arts, Florence, Italy, April 1972. National Endowment for the Arts (NEA) Artist Panelists and Consultant, 1978 – 1992. Cultural Arts Council of Houston, TX, Board member, 1977-78. The Art Department, Dominican College, 1971.